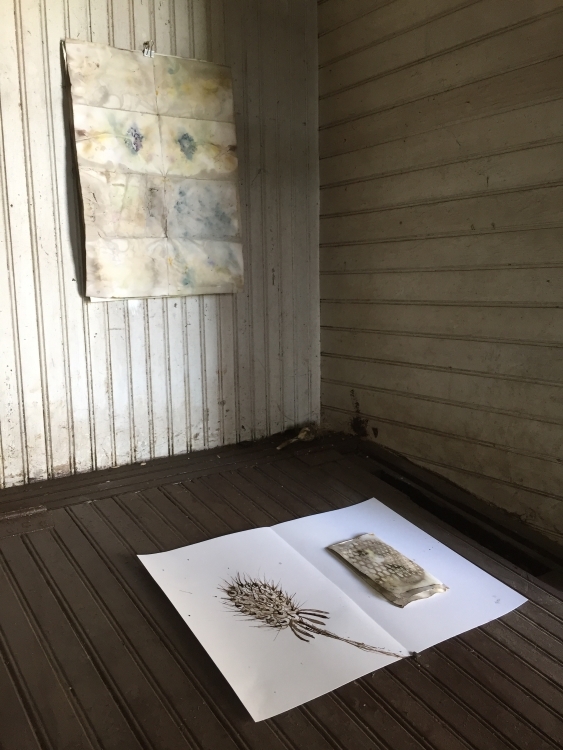 We learned that Brece Honeycutt (Drawing & Printmaking Finalist ’18) had been selected for two different artist residencies this summer. 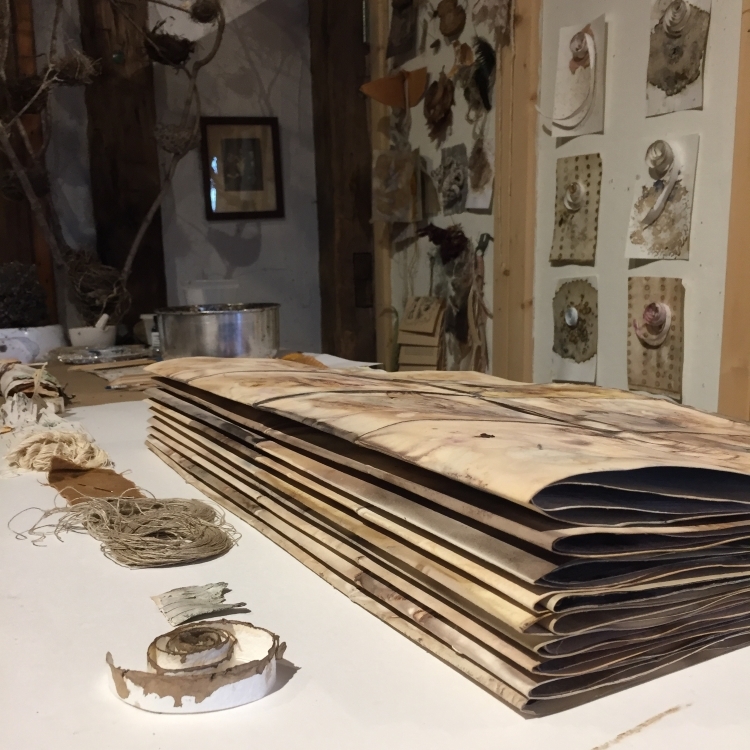 Here, she shares images and observations about the three studios in which she worked these last few months: her own in Sheffield, her residency at Norte Maar in Jay, NY, and her residency at Naumkeag in Stockbridge, MA. 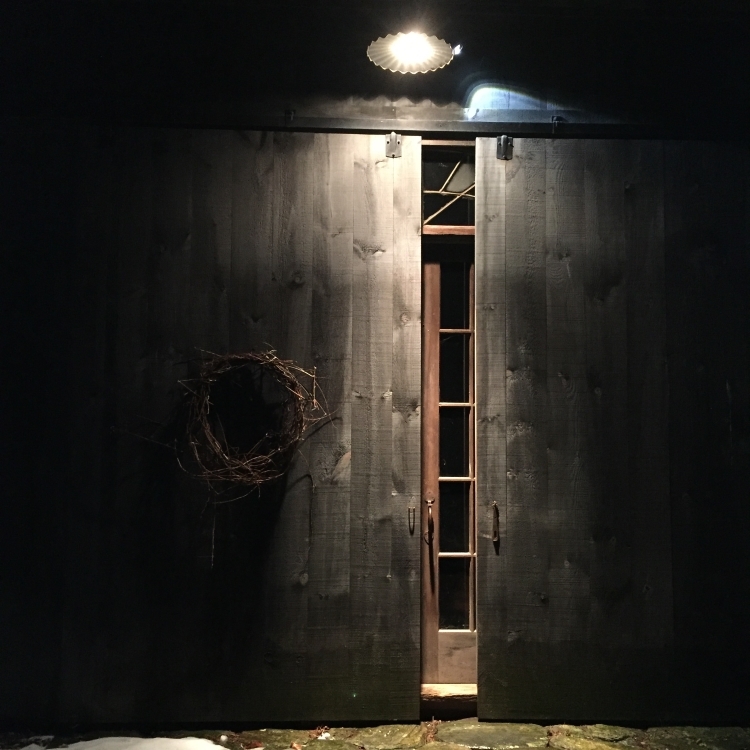 My barn studio is both outside & inside. 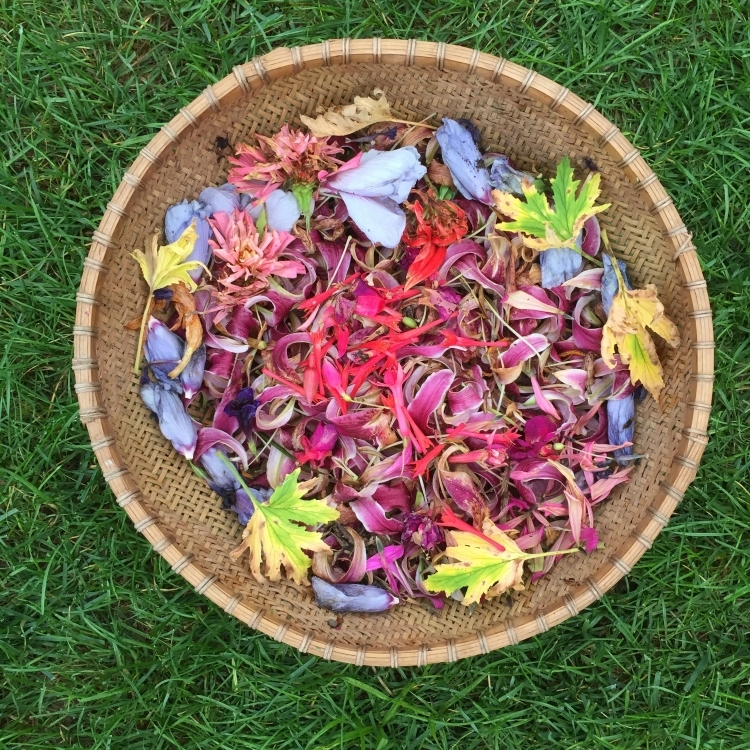 As I walk outside to soak in the place, to trod the adjacent fields and forests, my pockets fill with the landscape’s treasures – birch bark with its dots and dashes, unfurling hornet’s nests, fallen flowers & leaves, cast-off feathers. 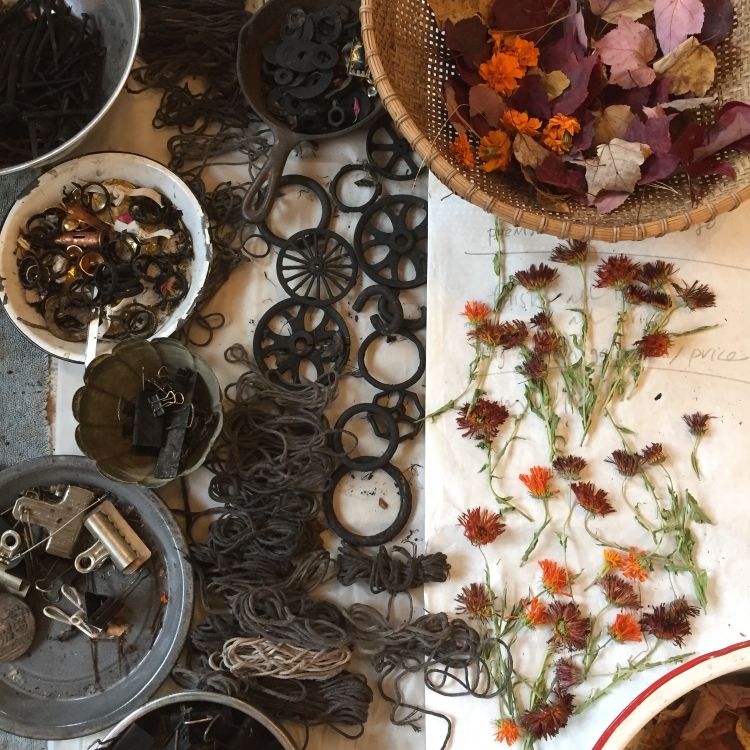 At the same time, my mind undertakes the cataloguing of the daily changes – freshly sprouted spring ephemerals, the mint filled with feasting honeybees, the autumn return of the junco and the departure of hummingbird. 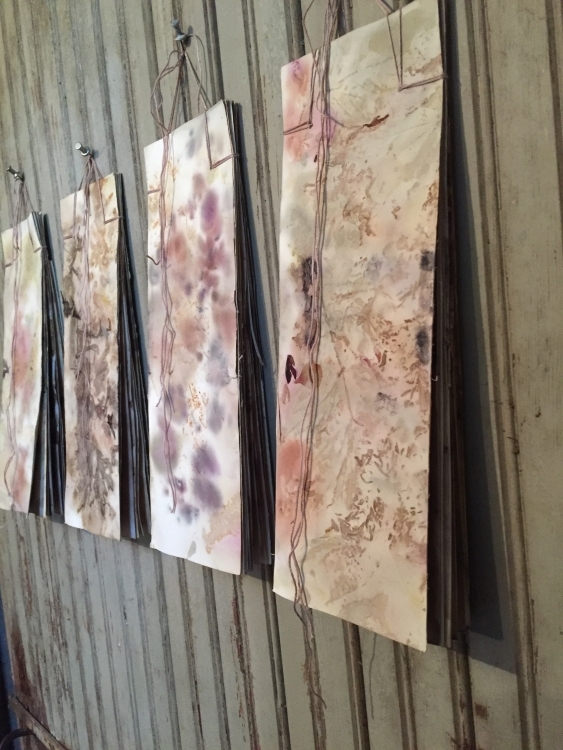 Later, these findings and sightings inform my work, and become marks on both paper and cloth and imbue the interior, mind and space, with the spirit of the exterior. 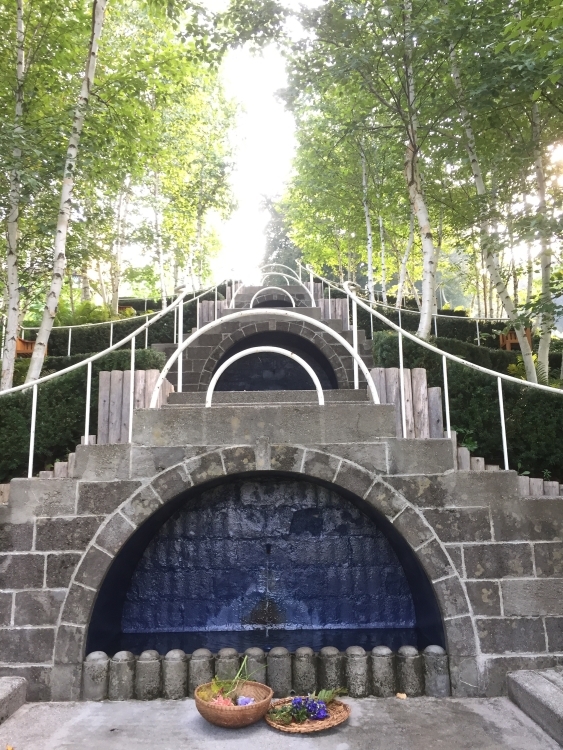 Situated in the Adirondacks, the Jay Barn anchors its valley and once centered a large horse farm. 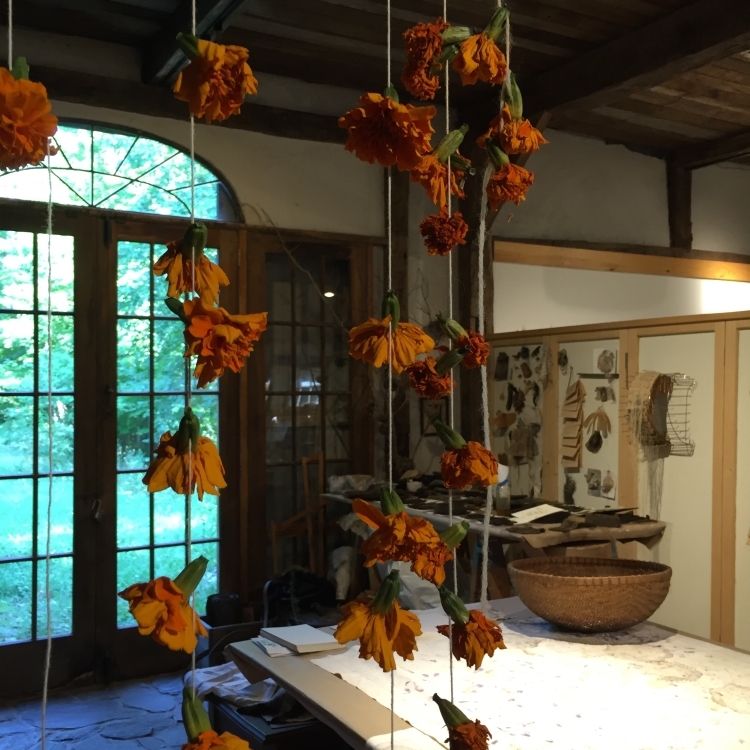 It currently provides its various spaces to artists in the summers through a residency program from the non-profit Norte Maar. 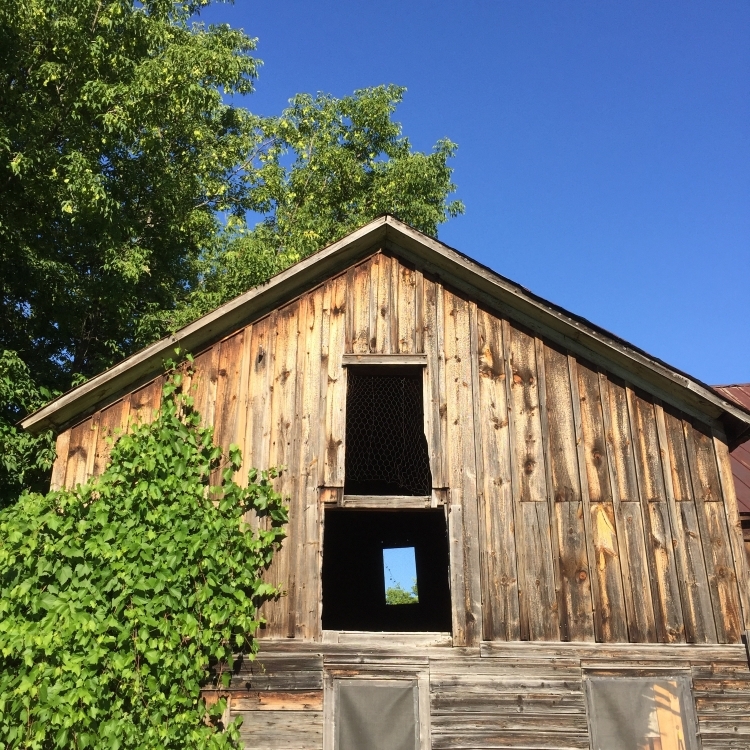 Hints of this barn’s historic uses patina the walls, with the stalls and bins of horse tack recalling its former inhabitants. New wood shores up the foundations from damage done during a recent hurricane, and electricity lines mark its leap into this century. Old and new, now and then, echo throughout the structure. 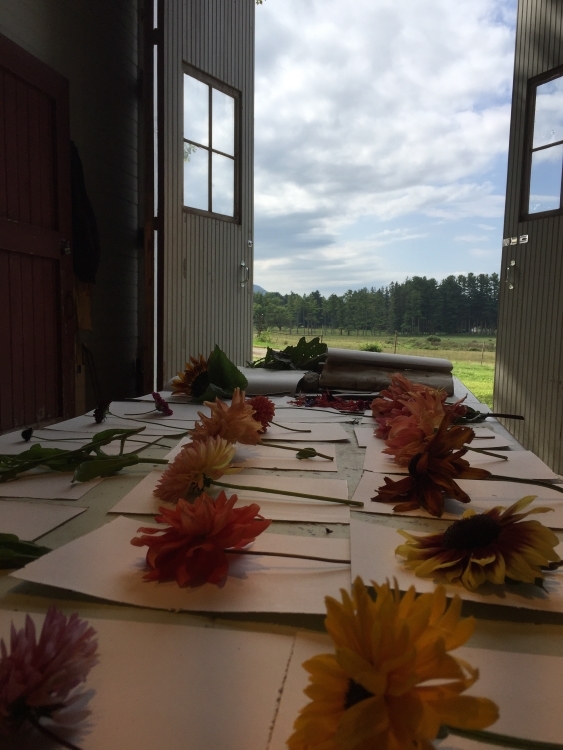 I worked with the stable doors open to catch glimpses of the far away mountains and to take advantage of the breezes, which often re-arranged the contents of my worktable. 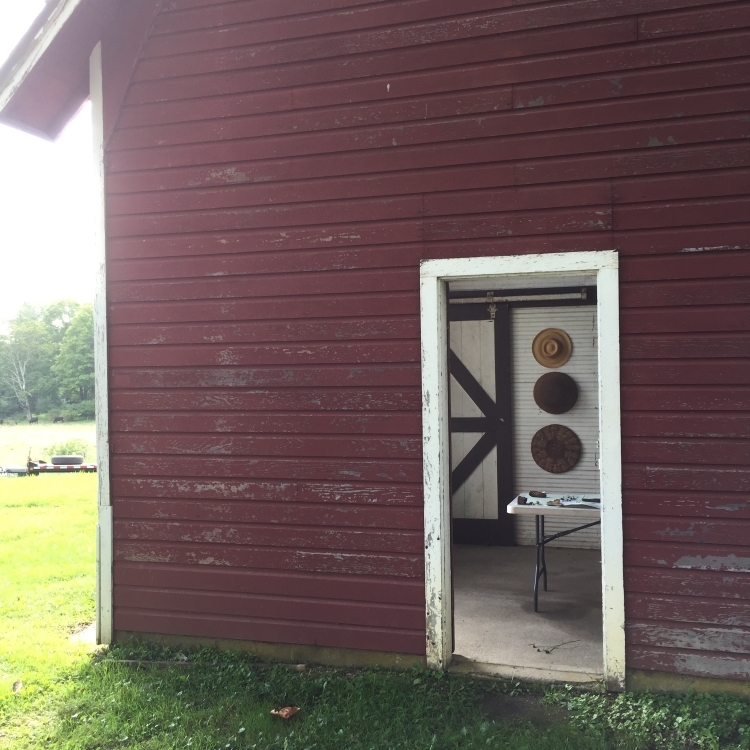 Directly outside the rear barn door, I walked along the edge of the field until I found the entrance of a nature trail carved into an overgrown abandoned pasture filled with tall stalks of joe pye weed, goldenrod, and milkweed; a winding path that circled around trees, under an archway made from tall shrubs, and circled back to a vista of the barn. 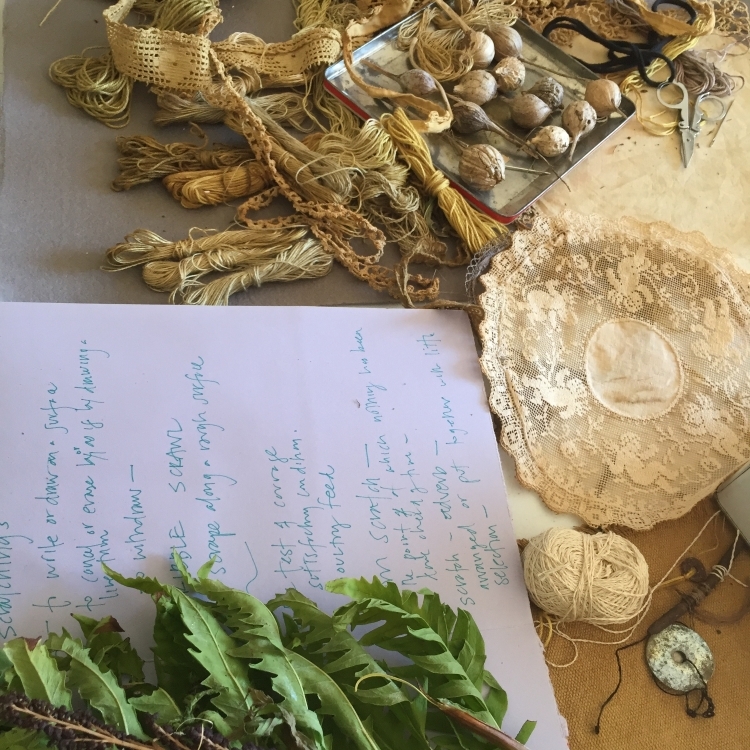 I stopped, stooped and gathered the galls and ferns at my feet, filling my apron pockets, and then spilled them onto my worktable. 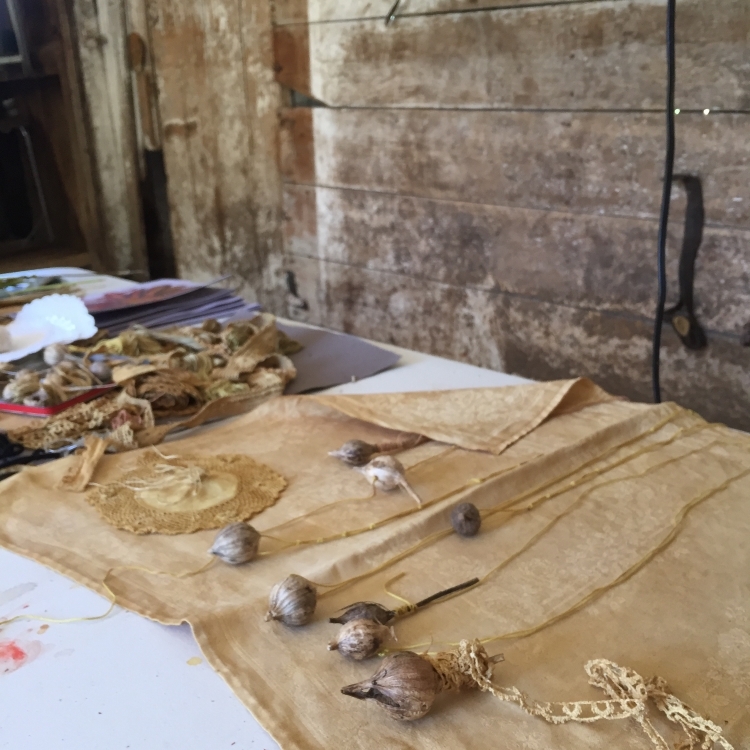 Exploring the galls—by drawing with walnut ink, by seeking their definition in a dictionary, and by assembling them into formations to become sculptures—became a daily focus of my residency. 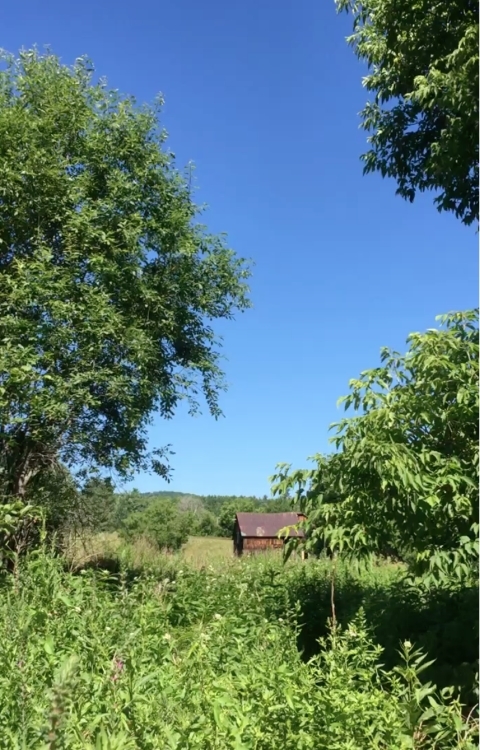 The 1928 Jamesway barn sits at the bottom of the hill from an historic house, Naumkeag, and once housed the dairy cattle for the Choate family. 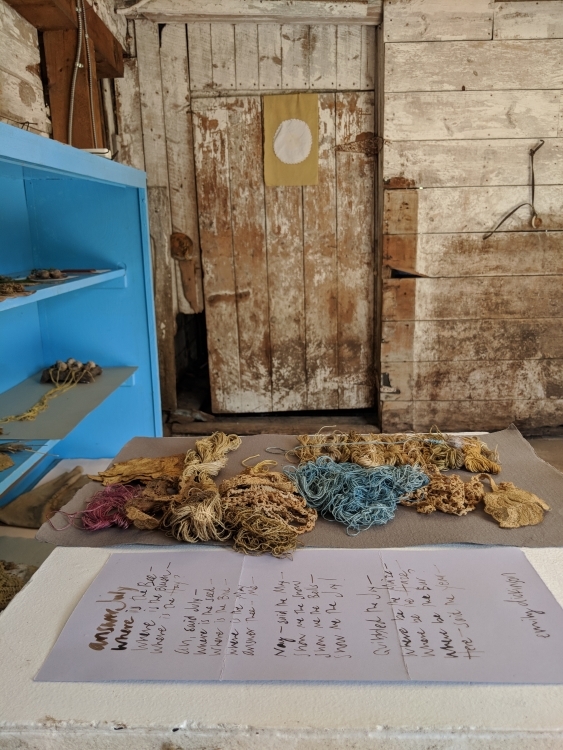 After Mabel Choate donated the property to The Trustees of Reservations, the barn and its contents fell frozen in time, as if the farmer just left, with all of the equipment in place. My “Artist-in-the Garden” residency at Naumkeag concentrated on walking the landscape designed by the preeminent designer, Fletcher Steele; harvesting plant materials from the luscious flower and cutting gardens; and working with the plant materials to mark the days by the imprints left by the plants on paper and textile. 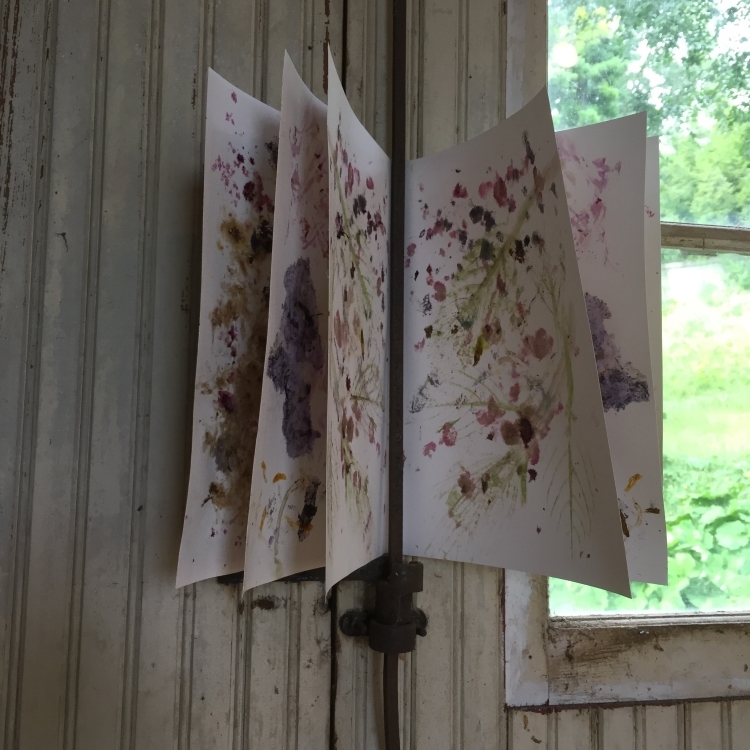 So many plants to gather – sunflowers, scabiosa, zinnias, fuchsias, calendulas, dahlias, amaranths – and to determine how they might leave an impression on paper or textile, by direct contact, by steam and dye, resulting in monoprints. Each day, I rolled open the big barn doors to let the outside in, catch the view of the distant mountains, watch the movement of the cattle in the field and the clouds in the sky. I made daily journals, folded from one sheet of paper, to record bird songs, sitings, walks, plants, definitions, place, and constantly carried it with me as I trod the land and paths, worked in the barn, stitched in the Chinese Garden and read in the early mornings or late at night, from inside to outside and back again. 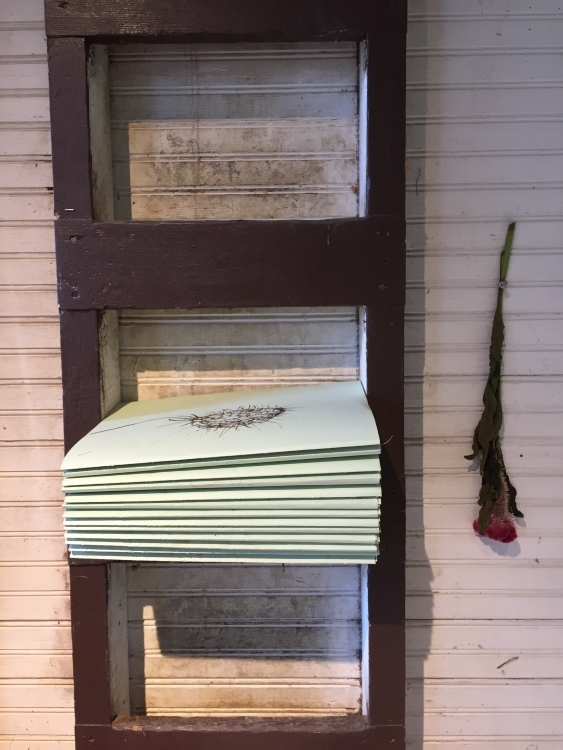 These journals fit perfectly in the hayloft stair tread, becoming a shelf. 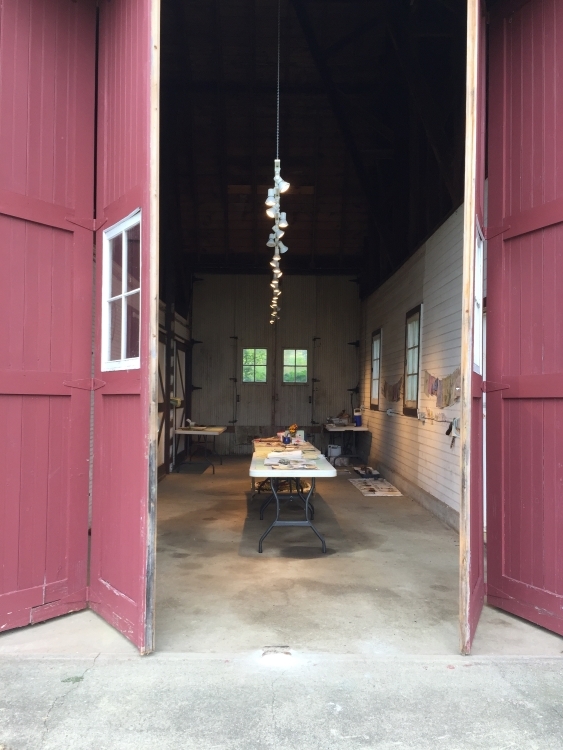 Working in the barns at Jay and Naumkeag, spaces with so much character, exhibiting signs of use and time, one wants to intervene as little as possible, hoping it never crosses the passerby’s mind that the object or artwork hasn’t been there for decades. 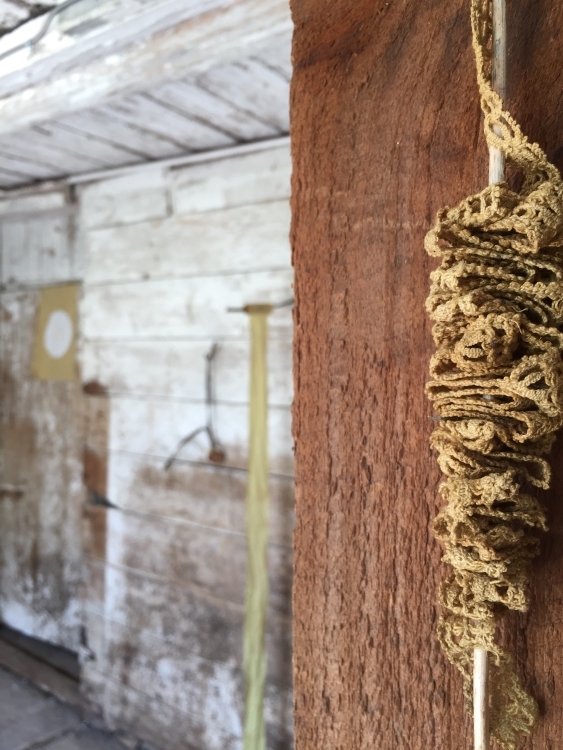 Daily, I hung and placed newly made sculptures in the barns, stepping back to look and ponder. 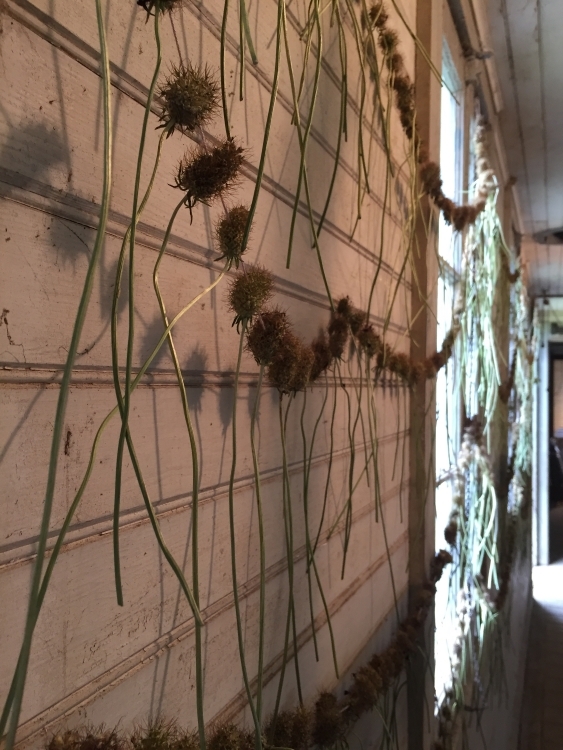 The deadheaded husks of scabiosa became garlands hung before the back windows; new ledger books made from naturally printed paper hung next to notes from the Massachusetts farm bureau, along with inspiring books and quotes placed upon the stand up desk and feed boxes. 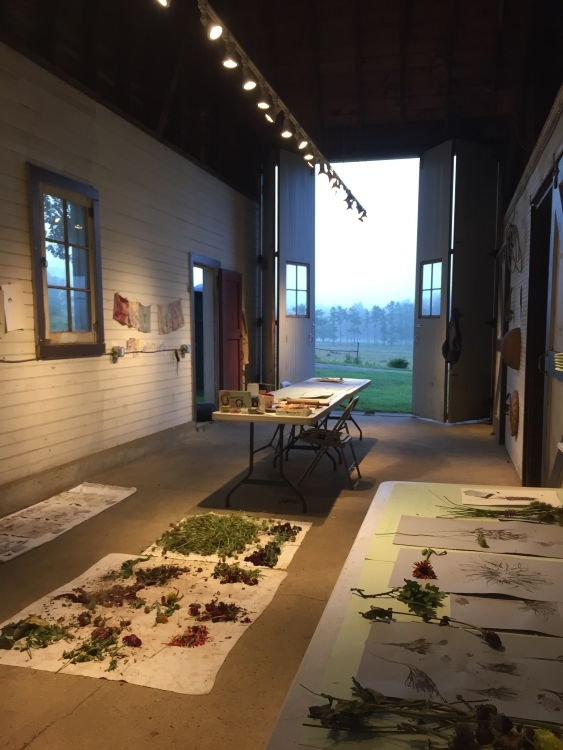 At the end of each residency, the works were packed away, the plant materials composted and a small work was left behind for someone to discover. Images: all images courtesy of Brece Honeycutt. Glorious balance between the barn’s interior and the natural landscape. T he paper forms resonated with the space they inhabited.